Dispute between government and Christian minority is settled after Copts criticised amendments to draft bill prepared by Egyptian Churches. For Coptic leaders, the new proposal is a step towards religious freedom. An armed man attacks a church in Cairo, wounds guard. Motives are still unknown. 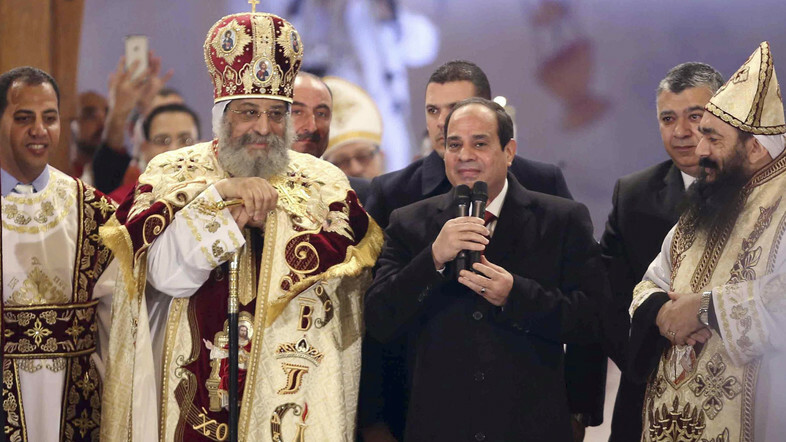 Christians back President al-Sisi. Cairo (AsiaNews) – Egypt's Coptic Orthodox Church says it has reached an agreement with the government over a long-awaited draft law on the building and restoration of churches. Government authorities and Church leaders had been at loggerheads over the long overdue and repeatedly postponed law. Only a few days ago, the Church had described some of the changes as "unacceptable amendments" and "impractical additions" to the draft bill, which had been jointly prepared by Egyptian churches. But following an extensive meeting of 105 of its bishops yesterday, and recent discussions with President Abdel-Fattah al-Sisi and Prime Minister Sherif Ismael, the Church says it now sees eye to eye with the government on the matter. The "Holy Synod announces, in good faith, reaching a compromise formula [of the law] with government representatives," the Church said in a statement early Thursday. The 10-article law is now expected to be sent to the cabinet for approval, then referred to parliament for final ratification. In the past, Christians and Muslims were clearly treated differently. Now the Church says it hopes the bill will prove a "step forward" in terms of freedom and equality of worship, facilitating the hitherto complex and lengthy process to build a church or Christian place of worship. In recent days the Coptic Orthodox community had criticised amendments proposed by the government, like allowing the construction of churches provided they have no outside cross or dome or that church size be "proportional" to the number of faithful in an area, a difficult task that lends itself to manipulation. In recent years, attacks on Egypt’s minority Coptic Christian community have increased. The rise has coincided with the community siding with the military after the July 2013 popularly backed military coup that unseated Muslim Brotherhood-backed President Mohammed Morsi. Scores of churches were burnt and looted following Morsi’s ouster, with the majority of attacks taking place in southern Egypt. In fact, extremist groups or individuals continue to attack Christian places of worship or targets. A knife-wielding attacker was shot dead yesterday after stabbing a guard at the Virgin Mary Coptic Church in Nozha, a Cairo suburb. Egyptian authorities are investigating the incident, but the attacker’s identity and motive have not been made public. Last month, in response to an attack on the Coptic community in Minya, President al-Sisi called for thorough investigation into the matter and the punishment of perpetrators. One of the first measures was the removal of the head of security in the area. Despite the attacks and uncertainties over the new law, the Coptic community maintains its support and appreciation for the president's words on the subject of religious freedom and equal rights. It is not uncommon, in fact, to meet people Egyptians who share the views of Samiyah, a Christian Coptic woman in her 70s, from Mar-Girgis Church in Heliopolis. She is also “praying that nothing bad will happen to President Abdel-Fattah al-Sisi,” because she thinks that “he is the one who saved Egypt at a time of ordeal”. However, she is certainly disturbed over the idea of a possible angry reaction from the masses who might be back in the streets to protest the harsh economic conditions, threatening the general’s hold on power. “I am just hoping that he will pay attention to the voices of those suffering and perhaps utilise better advisors to reconsider some economic priorities,” Samiyah said. She would like to see protection for the Christian minority, especially in Upper Egypt, as well as equality in religion because the constraints on church building are not the same for mosques. “I hope that every Christian will also have a church to go to that is not too far from where they live, especially for the sake of the elderly and the women in Upper Egypt who are not allowed to travel far without male companionship,” she explained.